Creating a graphics tutorial - comprehension help please. I've been trying to do this for a while now - and found that it gets too complicated too quickly. However what I do to tune the graphics is fairly simple. I've realised that's because I'm trying to fit too many things into the one tutorial. So I'm splitting it up. 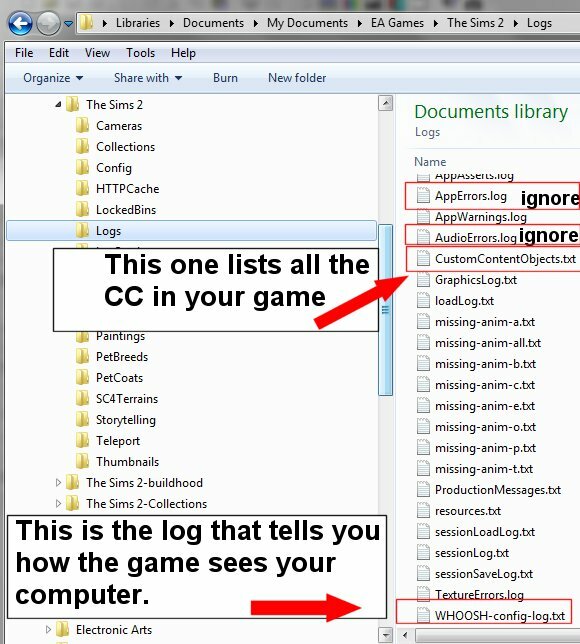 Tutorial 1: What's useful in the Log folder of the game. Tutorial 2: What does all the stuff in the CustomContentsObjects.txt mean. Tutorial 3: What does <yourpcname>-Config-log.txt tell you. Tutorial 4: What does video cards.sgr do, and how to update it. Tutorial 5: What does graphic rules.sgr do, and how to update it. Tutorial 5a: How to read basic xml programming in the graphic rules.sgr. Tutorial 6: A more in-depth look at graphic rules.sgr. a) it makes sense. This is the most important one. b) whether it is useful or not. c) is the size of the information is at a length where it is not overwhelming. d) if I'm telling the truth, or if I've got something wrong. I'm going to post the other ones up on this thread as well, until I have a final version. Then... well I would like to post them up here and at MTS. (No idea on how to do at MTS). Disclaimer: I'm on Windows 7, so the layout is going to be a little different to XP, Windows 8, or the MAC. Please interpret it for your O/S. There are a lot files in this folder that are generated at Game start-up and during the game, and on a game crash. (Or as programmers call it - during an exception). To start with - you can ignore all the files that have a size of 0. This means that they are empty. Apperrors.log and AudioErrors.log can be ignored. The game is shipped with these errors, and both relate to Audio, and in particular to the radio stations, and related audio. They don't appear to stop anything from happening, hence they can be ignored. where yyyy.mm.dd = date in year month day format, and hh.mm.ss is the time the exception occurred. Don't bother to look at the mdmp file, unless you have the reader for it, it will just be gibberish. We don't have the reader so...it's gibberish. This has some things in it, but is generally not useful unless you can read programs. The Hood, Prefix and Lot that you were in when you crashed. What happened - this is where if you have the code, it will tell you exactly where it fell over, and if you don't,it's a whole lot of numbers. Exception Code: is usually ACCESS_VIOLATION. What this means is that it tried to change something in a place where it shouldn't. i.e. not useful. Very rarely it *may* list an object or sim. So that leaves CustomContentObjects.txt and -config-log.txt as the useful ones. They'll be looked at in separate tutorials. This lists the Custom Content that you have loaded in the game, split up into mods and non-mods, where mods are listed first. This is OK, and nothing to be worried about. However it is a good way to get a list of all the Mods you use in game. 1st Line - The location of the CC on your PC. 2nd Line - The Name of the CC. This is an optional line, and if not there, just mean that it hasn't been name. For mods, this is quite typical. 3rd Line - Description of the CC. This is an optional line, and is the catalog description if there is one. means that it's changed a value that the game uses when doing things. Constants are values that never change. So 24 hours would be a constant for length of day. If we were to change the length of day to 25 hours, then this would be tagged as 'Overrides Game Constants'. Eg. Nostrayrespawn.package overrides Game Constants.So the stray respawn value has been changed to a value which prevents them from respawning. This overrides a Global procedure. A Global procedure is one that can be used anywhere in the game programs and processes.It can be a variable it's overriding. Variables are a value that changes depending on circumstances and what's been done to it. Global variables are set up to be something that is relevant to all the sections. So a Sims Surname would be one of those - as it identifies the family that the sim is in. When the sim changes family, the surname is changed (or not). A Semi-Global procedure is one that is only used in some rather than all places.So information about plants isn't used for sims so to save space and processing, it's got its own procedures that are only called for gardens, and plant-related activities. e.g. PerfectGardens.package changes a value that is only used in the gardens area of the game. This is the one that makes the game behave in a way different to what EA intended. Generally this is a good thing. eg. marriage-traditional.package changes the surname to the surname of the male partner. It changes the value of the Surname, and the code to determine the surname is the changed Game Behaviour. What I like about these tutorials is that they not only tell me what to do, but also what is going on and how something works. I am very much a 'why'-person and I felt like I learned something new that gives me the skills to (in the end) fix my own graphics problems So that is, I think, a good thing. I could easily follow them, as a non-native speaker. So to answer your questions: they do make sense, they are useful, but I can't tell you wheter they are true because you know more about this than I do I do see exactly what you tell me I should be seeing, so all is good. Whoops, I missed this when it was first posted. It looks very helpful indeed. I agree with everything Klaartje said. Thanks so much for taking the time to write it, kiri.